We are so blessed to live in a country where we can serve and worship God with no repercussions. That freedom is fought for every single day by the United States’ Military. We feel it is our duty as Christian Americans to show these people how much we appreciate and love what they’ve done for us. If it weren’t for their bravery and sacrifice, we probably wouldn’t have any freedoms left. It was an honor for John 3:16 Ministries to be able to show our gratitude to these men and women. 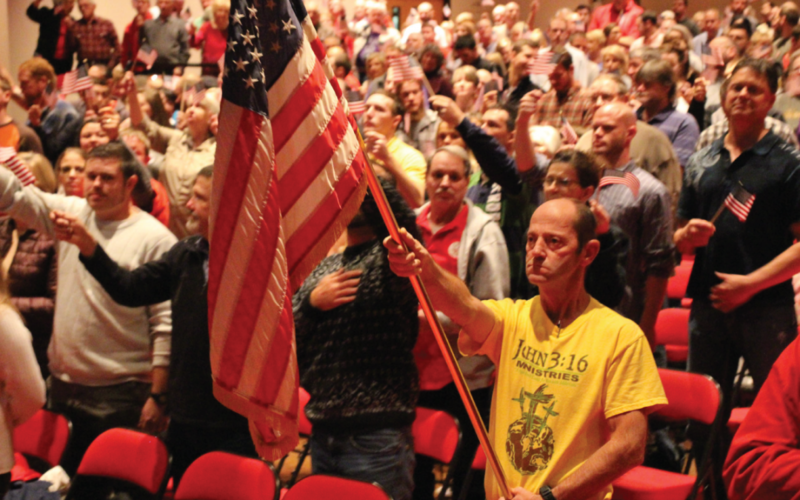 We celebrated Veteran’s Day at John 3:16 Ministries on Sunday, November 11th. Veteran’s Day is an annual holiday celebrating and honoring those who have served in the United States Armed Forces. The holiday has been observed in the United States since 1919. All of the veterans were asked to stand and say a few words. Many of them announced what branch they served in and gave a short testimony of their time in the military. After the last veteran spoke, the ministry had a raffle for them. The prizes included 3 American flag canvases, an Element 32” LED television, Wal-Mart gift cards, and a custom John 3:16 Ministries’ case knife. For the last prize, Bryan asked all of the 80 year old veterans to raise their hands, then the 90 year old veterans, and lastly, the veterans over 100 years of age. One man in the very back of the chapel raised his hand and won the case knife for being the eldest veteran at service. Lloyd Gathright was the oldest veteran to raise his hand at service. He is 101 years old. As soon as service ended, the veterans lined up for a special steak dinner which the ministry provided. Afterwards, the veterans fellow-shipped with the residents as well as their friends and family.